Help Support the Market! Click here to spread the word on Facebook! Stay in the know! 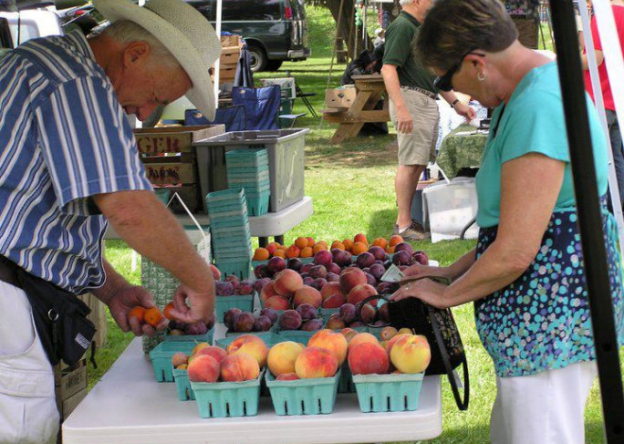 Click here to dig the farmers market on Facebook! The Seneca Farmers Market is located in the heart of Seneca Falls along Water Street. Found canal-side on beautiful grounds, we’re excited to offer more vendors than ever before. From the freshest of produce and hand-baked goods to hand-crafted items and delectable treats, there’s sure to be something for everyone. The market runs every Tuesday from June 11th through mid-October from 3:00pm until 7:00pm, rain or shine. When you’re done at the market, you’re a short walk to Fall Street where a wide array of shopping destinations await. You can also enjoy a stroll along the canal and enjoy the town’s sights. If using a GPS, enter “15 Water Street, Seneca Falls, NY” for the most accurate directions. We’re located in People’s Park on Water Street, which is right off of Fall Street in Seneca Falls. The market is held in the grass area alongside the canal and in front of the large white gazebo. If you spot a bunch of tents and people walking around with bagfuls of goodies, it’s probably us! You’ll find a large parking lot connected to the market area, but if that happens to be full, there is additional parking at the nearby Seneca Falls Community Center. Please pay attention to road signs as there are certain marked areas where parking isn’t allowed. Need help getting your goods to your vehicle? No problem! We can help carry your goodies to make the trek easier. The Seneca Farmers Market is held rain or shine. Inclement weather won’t stop the dedicated vendors so don’t let clouds or sprinkles keep you away. The only exception to this is if we’re experiencing thunderstorms or other dangerous weather conditions. We’ll post on our Facebook page should the skies pose a potential problem so be sure to Like us on Facebook for updates. Because all of the produce sold at the farmers market is fresh and local, the variety of goods offered will vary from week to week. Throughout the market season, you can expect a wonderful variety of fruits, vegetables, baked goods, artisan treats, crafts, and other handmade items. As well, you can expect delicious lunches to be available weekly from local eateries. You’ll definitely want to bring cash, as the vast majority of vendors won’t accept credit cards or checks. We also recommend bringing large bags or totes. While vendors will certainly bag your purchases, large bags or totes will make your trip easier. We’ll have a few wagons available for use but some choose to bring their own…the kids ride in and the veggies ride out! If you’d like to use your EBT/Snap Benefits at the Farmers Market, simply go to the market manager’s table by the gazebo. There, you can acquire tokens for use at the market and even enjoy bonus dollars. For every $5 you spend of SNAP benefits, you’ll receive a free $2 coupon good towards all SNAP-eligible items. Spend $10, get $4 free! Spend $20, get $8 free! with assistance from the Town of Seneca Falls and Cornell Cooperative Extension.